Manila, Philippines - Based on the Statement of Assets, Liabilities and Net Worth (SALN) filed by the senators for the year 2012, Sen. Manny Villar once again the richest man in the senate for a total net worth of P1.45 billion. Meanwhile, Sen. Francis “Chiz” Escudero is now the poorest senator having only more than P4-million net worth. Chiz Escudero became P5-million poorer after his annulment with his wife, Christine Elizabeth Flores on 2012. Last year, he declared a P9.87-million total net worth. Joint SALN of Villar's couple (combined with Senator-elect Cynthia Villar) reached P1.453 billion, with no declared liabilities. As per record of the Office of Senate Secretary, P1 billion was described as part of investments in shares of stocks in their family-owned corporations, namely Fine Properties Inc., M.B. Villar Co. Inc., Macys Inc., Mooncrest Property, Hollinger Holdings, and Starmalls Inc.
With over P468 million total net worth, Ralph Recto placed second richest. 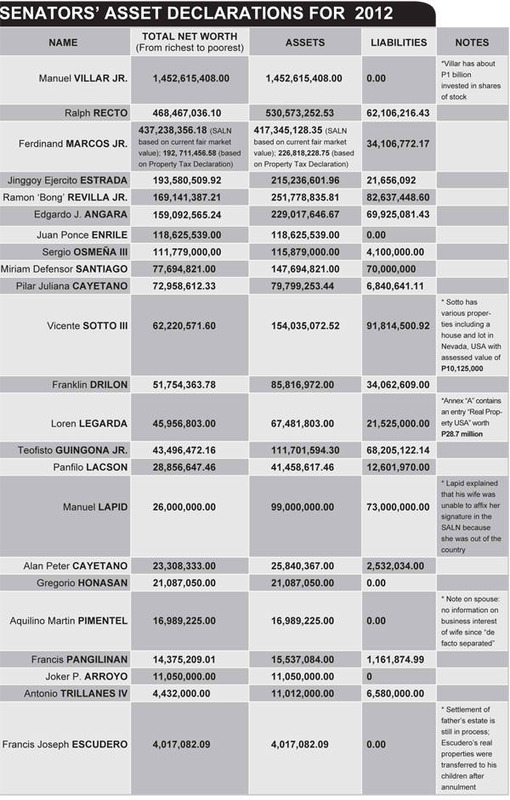 Ferdinand Marcos Jr. is on third spot with P437.2 million.